I can only think of a few definitive moments in my life when I said, "Ah ha! This must mean I'm growing up!" The first happened a few years ago when I realized that I quite preferred NPR over any music based radio stations. The most recent of these moments happened a few weeks ago when I realized that I preferred Free People to their sibling store Urban Outfitters. 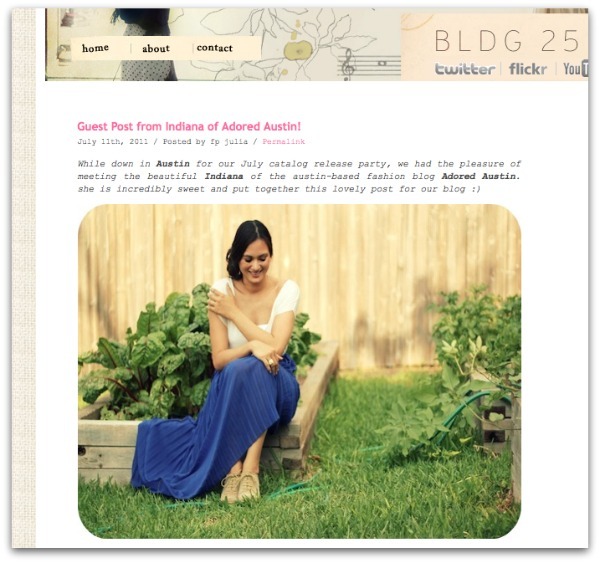 That's why I about fell out of my chair when Julia, one of the lovely ladies behind the Free People blog wrote me asking if I would like to do a guest post on Austin style. Would I? Honored to! I even ran around with Intern Rachel last weekend, snapping photos on South Congress for the blog. Check it out here. While you're there, go ahead and bookmark their blog. Their company blog is amazing-- so interactive and inspirational! It was a great shock to be asked to contribute to something so cool.